I love activities that are specifically related to a theme or holiday. Using different materials to work on some of the same goals can add life to therapy and possibly produce different results. I love anything “NO PREP” – especially when I need to gather materials quickly. 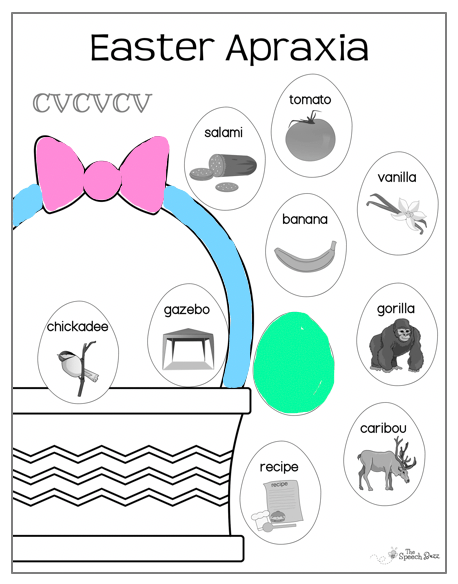 This No Prep Easter Apraxia product allows for variety, speed and fun!!! I just print out a sheet for the particular pattern of sounds that a student is practicing, grab some crayons and begin collecting data. It’s as easy as that!! Have a great Easter therapy time full of bright colors and fun! « Articulation Wheels – a fun way to monitor progress!